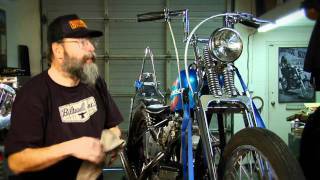 In this instructional videos for garage builders brought to you by Lowbrow Customs, chopper guru Frank Kaisler takes you through the care and service of Harley-Davidson's popular Ironhead Sportster engine. Applying four decades of motorcycle experience, Frank shares the hard-earned tips and tricks that served him so well over the years. Many aspects of engine tune and service are covered in this video: changing fluids, valve train, ignition, timing, fuel system, electrical. Follow Frank's tips and tricks and you'll build the skills you need to resurrect that old project and keep your bike running strong with confidence. Over 2 hours of killer content! I bought this thinking it could be a good companion to the Factory Service Manual. It is not. This video is not, I say again, NOT worth $40. I suppose it could be useful to someone with zero experience AND no FSM. But anyone else save your bucks for the FACTORY SERVICE MANUAL!! You really should get this great video! It's an interesting video if you are just starting out. Good info on valve adjustment and magneto set up. It's not a replacement for the factory service manual and it doesn't claim to be. Tune & service. That's all this covers. this video gave me the confidence along with the transmission video to buy a older sportster and not fear a bigger repair if one pops up.